Q. Is standard concrete used in making PERMA-COLUMNS? A. NO! Perma-Columns are poured in a controlled environment using the latest pre-casting and curing technology. Additives are incorporated to enhance strength, density, corrosion and freeze-thaw resistance, yielding a HiDense concrete that has a compressive strength of 10,000 psi. Concrete is the most proven foundation material known to man… with centuries of success. Q. How is the steel “U” bracket attached to the concrete? A. There are four strands of 1/2” or 5/8” (depending on the model) of weld-grade rebar, robotically welded to the steel “U” bracket running the 5 foot length of the concrete pre-cast. Q. How do you set PERMA-COLUMNS so they are all level? A. Place a laser level on top of the auger head as the post holes are dug to insure that all holes are a uniform depth. Backfill the bottom of the holes with tamped stone before setting posts for greater accuracy..
Q. Will treated wood corrode PERMA-COLUMN brackets and fasteners prematurely? A. Most current generation treated wood available today is designed to minimize corrosion. However, if you have a high moisture application or are concerned with this problem, place a barrier between the treated wood and steel bracket, and use stainless steel fasteners. Q. How is the treated splashboard attached to the concrete? A. Position the splashboard against the pre-cast concrete column, pre-drill the correct diameter hole through the splashboard two inches deep into the concrete, and then drive a split-drive anchor to attach. Stainless steel drive anchors are required for highly corrosive wood treatments. Q. How deep should PERMA-COLUMNS be placed in the ground? A. PERMA-COLUMNS are slightly wider in the dimension that resists lateral loads thus decreasing embedment requirements and are generally designed to have a base depth equal to or less than a standard wood column. Q. Do PERMA-COLUMNS need to sit on a concrete footing? A. It is recommended that the same size footing required for a wood support column be used for a PERMACOLUMN to insure that proper load-bearing requirements are achieved. Q. 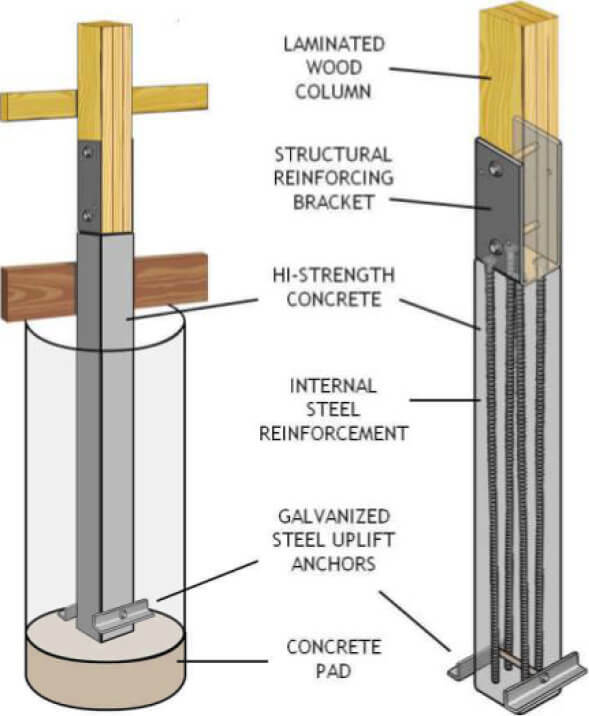 How are the galvanized uplift anchors connected to the PERMA-COLUMN? A. A steel pipe is welded to the base of the four vertical reinforcing rods creating a sleeve in the base of the PERMA-COLUMN that accommodates the bolt-on uplift anchors. Q. What if the embedment depth exceeds the 5’ length of a standard PERMA-COLUMN? A. Option 1 - When it is required to go deeper into the soil profile, 6 and 7 foot PERMA-COLUMNS are available. The additional length is accomplished internally by extending 2 of the rebar and steel pipe within the lower portion of the pre-cast column. Option 2 - A column extender (stilt) is connected to the base of the PERMA- COLUMN lifting the columns to the desired height. Concrete is then poured around this extender, creating a combination footing and uplift anchor. Q. How do PERMA-COLUMNS compare in cost to other concrete foundation? A. PERMA-COLUMNS provide the quickest and least expensive concrete foundation for post frame construction. There is no waiting on a concrete subcontractor to complete his work before the builder moves in. Unlike a monolithic slab, the structure won’t “float”. Finally, the steel bracket to wood connection is elevated 12” to 16” above the floor ending all possibility of rotten posts!